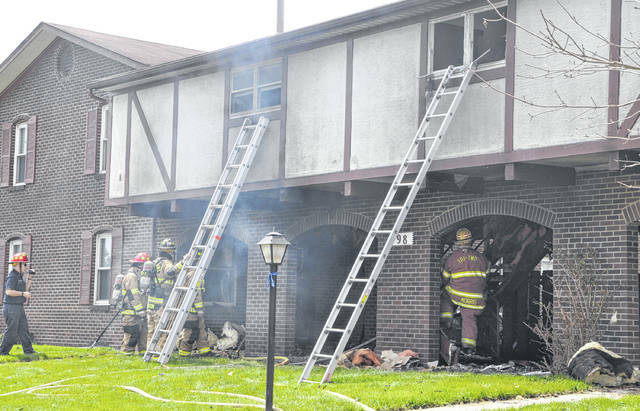 City of Delaware firefighters rescued two individuals Friday afternoon after an apartment at 98 Carriage Drive caught fire. Officials report the two rescued individuals were trapped in a second-floor bathroom before being removed from the building by firefighters using a ladder. Both individuals were transported to The Ohio State University Wexner Medical Center in Columbus for treatment. No firefighters were injured. The fire is being investigated by the department’s fire investigators, and an estimated loss has not been determined. The Red Cross has been contacted to assist the occupants of the two apartments.